This book is a ghost story for young adults, with a protagonist who is almost 15. Tabitha moves with her parents and four-year-old brother Ben to a flat within a Victorian mansion, where her father has been employed as curator. Tabitha's father is full of enthusiasm for his new role, while her mother is grappling with depression. Meanwhile, Tabitha is unnerved by Weston Manor's atmosphere. Why can she suddenly smell lavender in certain rooms? Whose voices can she hear? Why are the old servants' bells ringing at night, and who's that playing croquet on the lawn? I really wanted to like this book, and haunted houses are usually a winner with me, but unfortunately I found The Haunting of Tabitha Grey a bit lacking. First of all, there just isn't much to Tabitha as a main character. She's a stereotypical teenage girl interested in makeup, clothes, romance novels, her handsome but unbelievably dull boyfriend Jake and her best friend Gemma, who is also very forgettable. Being 'sensitive' to ghostly presences is the only thing about Tabitha that I found particularly interesting, and that alone isn't really enough to carry the story. The ghostly goings-on themselves are depicted with skill - there's nothing you haven't seen or read before, but ghosts don't have to be original to be creepy - and the manor house setting is also nicely described. But there a some elements of the plot that don't ring true. For example, I don't think any father, just weeks into a new job as curator of a stately home and hosting an important visit from local dignitaries, would ever suddenly ask his 14-year-old to give them their guided tour, particularly when she's just been off school sick with nosebleeds, fainting fits and apparent hysteria. This is a book that has a supposedly stunning twist towards the end, but I saw it coming when I was just under halfway through the book and without the element of surprise there's definitely something missing at the end of the story. The idea is a good one, but it's not executed with much subtlety and it's easy to spot, particularly for regular readers of ghost stories. I realise that I'm an adult and this a book for kids and teenagers, but I don't think I'm asking too much of it in terms of plot and character. Juno Dawson, for example, some of whose books I've reviewed when she was writing under her previous name of James, writes teen horror with characters who are much more convincingly developed and plots that often have a real sting in the tail. 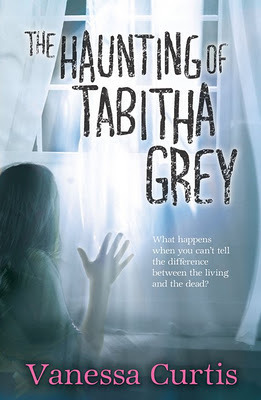 The Haunting of Tabitha Grey has some promising elements, as it's atmospheric and spooky and the family drama plot strand is also nicely done, but overall it all just felt a bit below-par.